Thera-Band® Resistive Exercise Bands cost much less than other exercise equipment sold with claims of achieving similar results, plus they are portable and versatile with virtually unlimited uses. Recognized and used throughout the world, they are endorsed by the American Physical Therapy Association (APTA). With Thera-Band® Band Systems, measuring progress and achieving goals for fitness or therapy is easier than ever before. Different resistance levels are determined by thickness of the band or the tubing. And we designed the Thera-Band® Progressive Resistance System with color-coded levels increasing in difficulty from tan to gold. This comprehensive system provides positive reinforcement and feedback for gauging results. * Click on the Product Code number to order Thera-Band Resistance Band Accessories. Versatile. Easy To Use. Affordable. Durable. Women. Long-Term. Older People. Daily. Men. Short-Term. Do not come with instructions, but you can find numerous websites that show excercises to do with them. They are easy to use and provide a good work-out. Allegro Medical offers them at the most affordable prices. Easy To Use. Durable. Portable. Sturdy. Compact. Targets Muscles. General Fitness. Strength Training. Daily. Older People. Women. Home. Frequent Exerciser. Person with disabilitie. Person with disabilitie. TheraBands let me easily target specific muscle groups and modify exercises so that I can use them seated for balance. The graduated resistance allows me to tailor resistance to muscle strength and increase resistance as the muscles become stronger. Multifunctional. Versatile. Easy To Use. Durable. Portable. Strength Training. Long-Term. Daily. physical therapy. I use these bands for physical therapy and they're great. I use them every day and they are very durable as long as you aren't retying knots in them (to change the size of the band). I use other theraband products as well and love this company's quality. I have an exercise ball that I've used every day for 5 years and have had no problems with it. Targets Muscles. Easy To Use. Compact. Multifunctional. My wife uses these bands to strengthen necks and shoulders. Spinal surgery was recommended 10 years ago, but daily use of these bands has kept her out of the operating room! Easy To Use. Durable. Exactly what I needed. Strengthen my shoulder joints to keep them mobile. Can you buy the bands by the yard, or do you have to buy the whole six yards? Does anyone know if the Thera-bands have an expiration date? While they Thera-bands do not have an expiration date per se, they do become old and brittle, causing breakage, after time. Please tell me more about this box of theraband, 6 yards medium. How many people will a 6 yard box cover? How do we measure them for each person? To perform the exercises correctly you need to measure out about 4' per person. For folks under 5' you may be okay with 3'. No but here is some info from the Thera-Band website: The powder is used to keep the product from sticking to itself during manufacturing. The powder will be removed with normal use, and is not necessary for proper functioning of the product. Thera-Band® Latex-Free bands, however, do not contain powder. Are all of the Thera-Bands latex-free? No, they are not all latex free. 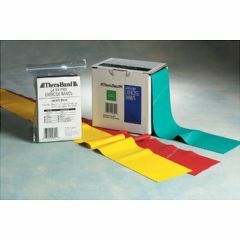 Regular Theraband are latex bands. You need to check before purchasing to ensure that it is a latex free style. Cando also makes a latex free exercise band. No. According to their website, they produce both synthetic rubber latex-free and natural rubber latex versions.